Tōma's friend and classmate. A funny individual who tends to see Tōma's bad luck, who he calls "Kami-yan," in a different way. He is a self-confessed pervert, lolicon and masochist who enjoys being punished by his teacher, Tsukuyomi. He is always seen with Motoharu. Together with him, Motoharu and Tōma, they are known as the three idiots in their class, as not only do they have the lowest test scores but also they are all level 0's except the latter two have good reasons for being that way. 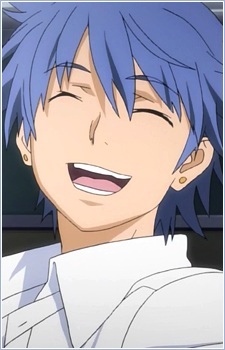 "Aogami Pierce" is actually a nickname that means "Blue Hair With Piercings." His real name has not yet been revealed.